Operating in London for more than 25 years, Rosebery’s London is a privately owned specialist fine art and antiques auction house, with offices in in the heart of the London’s Mayfair and Lambeth. In 2013 Roseberys was shortlisted by BBC Homes and Antiques magazine as Britain’s best auction house, and made art world headlines when they sold a rare Léon Bakst oil painting for £530,000. More recently we successfully offered a selection of clothing and accessories from the private collection of the renowned fashion editor Suzy Menkes, and have hosted several online only auctions, including the successful sale of a large private collection of furniture by the French designer Philippe Starck, and American designers Charles and Ray Eames. 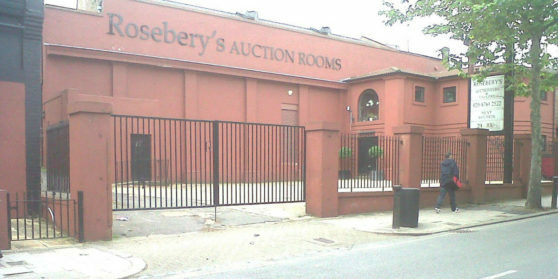 Roseberys are members of both the Society of Fine Art Auctioneers (SOFAA) and The Association of Accredited Auctioneers (AAA). Expansion in to the Far East saw us hold our first auction in Beijing in 2012 as part of the groundbreaking AAA, with further events planned for the future.